That's 'My Son Screaming' On 911 Call, Trayvon's Mother Says : The Two-Way A key piece of evidence in the trial of George Zimmerman is whose voice can be heard on a recording yelling for help. Sybrina Fulton, Trayvon Martin's mother, testified Friday that she's sure it was her son who was screaming. 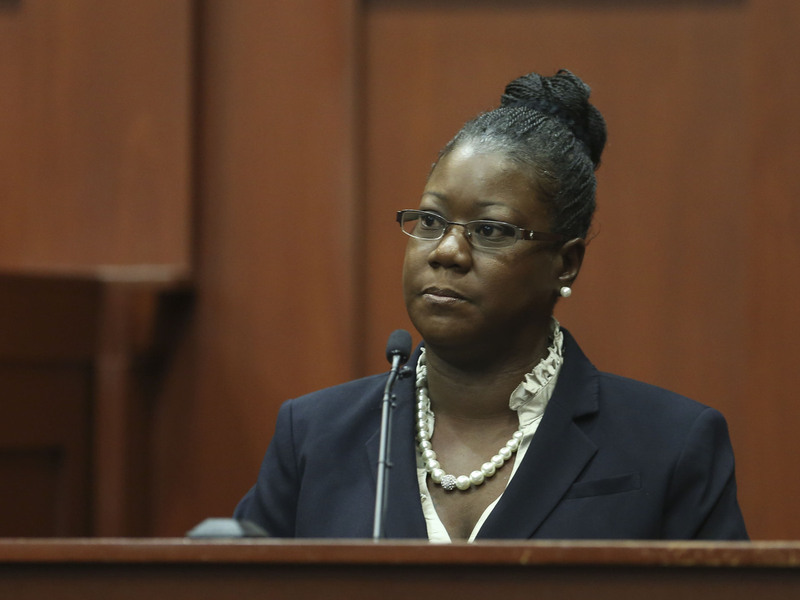 Trayvon Martin's mother, Sybrina Fulton, testifies Friday in Sanford, Fla.
Update at 5:50 p.m. ET. The prosecution concluded its case Friday in the trial of George Zimmerman. Afterward, the judge denied a request by the defense to acquit Zimmerman of second-degree murder. The defense had argued that the prosecution had failed to prove its case against him. During one of the most anticipated moments of the trial so far, Trayvon Martin's mother said in a Florida courtroom Friday morning that "I heard my son screaming" when she listened to the recording of a 911 call made as her son and accused murder George Zimmerman were engaged in their deadly confrontation. Sybrina Fulton was called to the stand to offer her testimony about a key piece of evidence: whether the voice heard on that recording is that of her 17-year-old son or of self-styled neighborhood watch volunteer Zimmerman. If the jury concludes it was Trayvon yelling for help or for Zimmerman to stop, that could buttress the prosecution's case against Zimmerman, who has been charged with second-degree murder. If the jury decides there's not enough evidence to reach that conclusion — or that it might be Zimmerman's voice — that would bolster the defendant's case that he acted in self defense. "Asked whether or not anyone 'prepared' Fulton to listen to the tape, and she said that no one had prepared her to listen to the tape. O'Mara asked whether she was 'holding out hope' that Trayvon Martin wasn't responsible for his own death. If it were Zimmerman's voice on that recording, that could mean that Trayvon had done something to cause his own death. "[Said] Fulton: 'I heard my son screaming.' "
The Sentinel has a webcast of the trial, and is posting live updates, here. The Miami Herald's coverage and webcast are here. Zimmerman, who was 28 at the time, has not contested that he shot and killed 17-year-old Trayvon Martin on Feb. 26, 2012, in Sanford, Fla.
Zimmerman, a neighborhood watch volunteer, had called police to say a "suspicious" young man was walking through his development. At one point, Zimmerman got out of his vehicle. He says that as he was returning to the vehicle, Trayvon threatened and attacked him. Trayvon's family and supporters say Zimmerman racially profiled the young African-American and should not have been following the teen. The case ignited a national conversation about profiling and race relations.